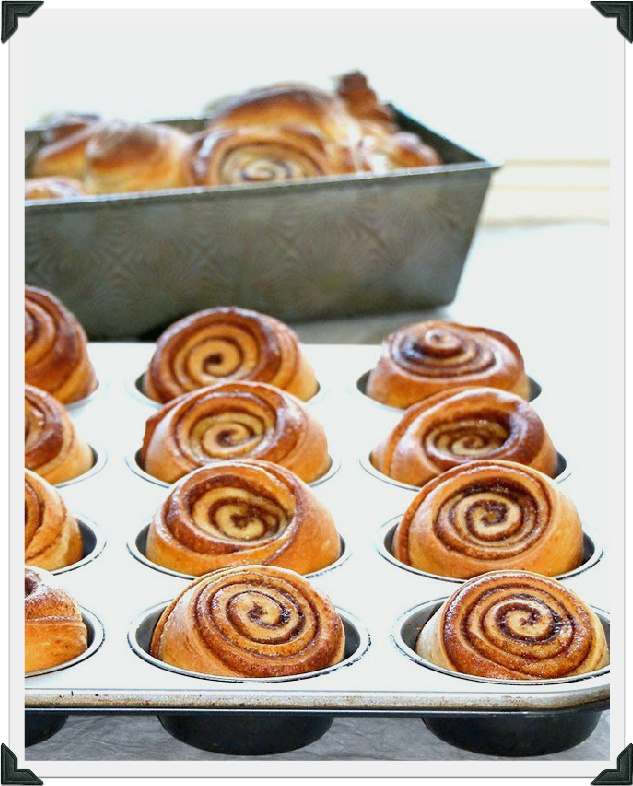 These are simply the best cinnamon buns in the world! And super festive. Have them all ready to go the night before and then bake them up on Christmas morning for a special treat! They are super soft and moist thanks to the butternut squash puree, and packed with goey flavor from the spices, vanilla bean and dark brown sugar. I just know that you will love them! This recipe makes 12 medium buns. But if you prefer jumbo Cinnabon style buns, slice the log of dough into 9 instead and adjust the baking time. Using dental floss to slice the rolls is a great way to prevent them from getting all squished and flat! I've seen this trick performed in numerous Food Network episodes and have also read about it in cookbooks! I've always wanted to try it! And it was really cool! Pulse the dough about 8 times, or until dough comes together in a ball and almost no dry ingredients remain. The dough will be a little sticky to the touch but will still be manageable with floured hands. If there is still a significant amount of flour remaining in the bowl, drizzle in a little more warm water or milk. But, if the dough isn't forming a ball in the food processor because it's way too sticky, sprinkle 1 tablespoon at a time of flour into the food processor bowl until the dough has the right consistency. It should be moist and a little tacky, but should not be so sticky that you can't remove your finder from it without pulling away some dough. With floured hands, remove dough from food processor and place in a large buttered bowl and shape into a round. Cover bowl with saran wrap and place in a warm spot. My gas oven works really well as a proofer because the pilot light is always on. Allow dough to rise for about 1 hour, or until dough has doubled in volume. Grease a baking pan with some vegan butter. Or line with parchment paper. Set aside. In the meanwhile, prepare the sugar spice filling (below). Set aside. Mix the sugar and spices in a small bowl and set aside for later. These are approximate measurements. I usually just sprinkle sugar and spices free-hand on the rolled out dough until it looks pretty saturated... about a half inch in thickness. Once the cinnamon bun dough has doubled in size, remove the saranwrap and gently punch it down until it's more or less deflated. The dough should feel really soft and souple. It should be easy to handle. With floured hands, transfer to floured counter top and stretch into a rectangle measuring approximately 14- x 12- inches. Pour 5 Tbsp of melted vegan butter over the dough and brush all over. Sprinkle dough evenly with the sugar-spice filling. Starting at the long edge of the rectangle, roll dough very tightly. Pinch the seam to make it hold. Slice log crosswise (using the dental floss trick, or simply a sharp serrated knife) into 9 - 12 pieces. Gently transfer to buttered baking dish. Cover with saran wrap and let rise in warm place for about 45 minutes or until rolls have doubled in size. Bake buns for about 15-20 minutes, or until tops are golden and the inner rings of the rolls are no longer raw and doughy. You could make a blueberry sauce or syrup to drizzle over the buns instead (or in addition to!!) the vanilla bean glaze. Cinnamon Apple Ginger Blueberry Buns sound amazing! Instead of the butternut squash puree, use apple sauce or even apple butter! Throw in a handful of diced apples, dried blueberries and tiny pieces of candied ginger chunks to the bun filling. Maybe even a couple pecans! Wow! So decadent! You could also make a sort of apple pie mix. In a small bowl, mix diced apples, walnuts, cinnamon, maple syrup and vanilla bean powder. 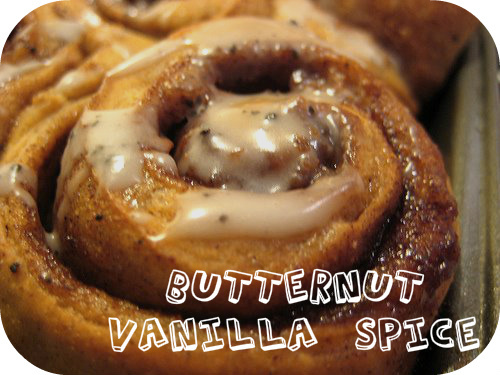 Scoop spoonfuls of this mixture over each bun right before baking and gently press into the dough. MMmmmmm! 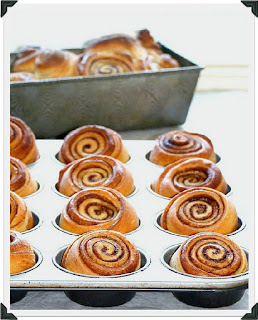 You could also bake mini cinnamon buns! Use a well buttered muffin pan (or some pretty liners)! Just sprinkle a little brown sugar and cinnamon and maybe a couple crushed nuts in each muffin hole before depositing each roll into the muffin pan.